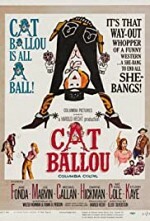 Watch Cat Ballou: Cat(herine) Ballou's family farm is being threatened by the Rail Road. She sends for Kid Shelleen, finding him to be the drunkest gunfighter in the west. When her father is killed by the rail road magnate's gunman, she vows to fight on. Shelleen manages to ride sideways in several scenes, while minstrels sing the ballad of Cat Ballou in between scenes.